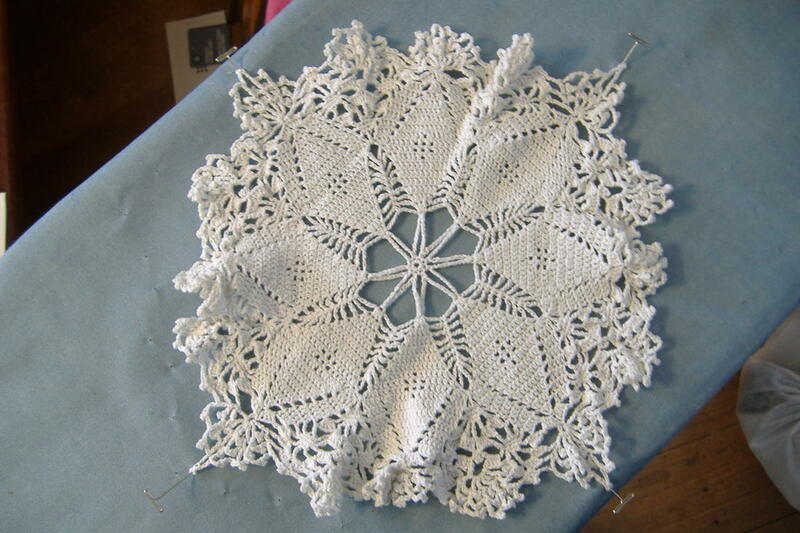 I have to admit that I have a soft spot for hand-made doilies. Yes, I know they are old-fashioned... but maybe I'm a bit old-fashioned at heart. 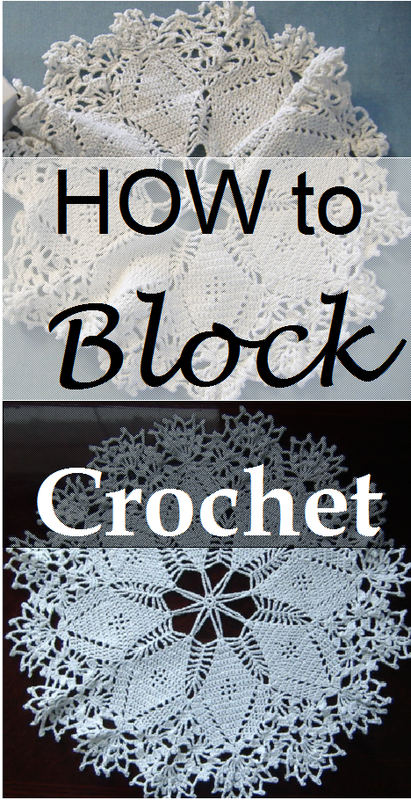 Have you ever crocheted some beautiful lacy item, but when you're done it doesn't look at all like the lovely photo which inspired you to begin crocheting in the first place? It can be rather disappointing. Let me walk you through the steps using a lovely doily my grandmother made me about 10 years ago. Step One: Gather your gear. You'll need a lot of T-pins (also called blocking pins) and a surface that you can stick them into. I use my ironing board for smaller items. 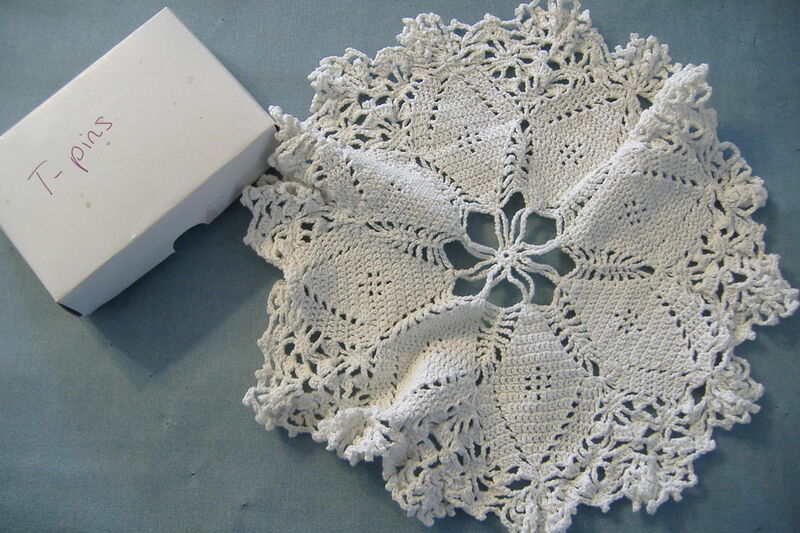 Don't forget your doily! Step Two: Spread out the pattern and see if there are certain repeats or quadrants that you can use. This one has 8 pointy diamond shapes, so I divided it into quarters. This will allow me to keep it relatively even as I pin. I will then divide each section in half. Then each of those sections will be divided in half again. Step Three: Once the doily is pinned out roughly, I will focus on each individual flower cluster at the tip of each pointy bit. Doesn't that look better already? Step Four: Now that the shape is beautifully pinned out, it's time to iron. Ok, so there might be a tea break between photos. It's a lot of pinning! I set my iron just before "really hot". It's almost at the cotton setting. My iron has a steam button, which I use to puff hot steam onto the doily as I iron. 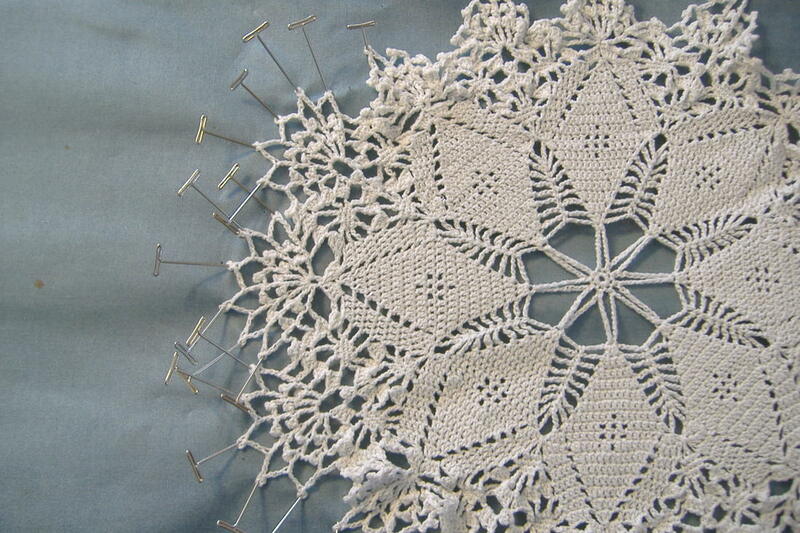 Now - and this is important - I leave my doily pinned to the ironing board to cool down (while I have some more tea). I made the draw on April 5th, and the winner is (drum roll please) Cherlyn. Cherlyn commented, "Congratulations on 5 years! That's a whole hand! Your shop is gorgeous, your wool is gorgeous and you my dear, are gorgeous as well. If I won, I would try the felting wool! ❤ "
You get to pick between these 2 lovely prizes. 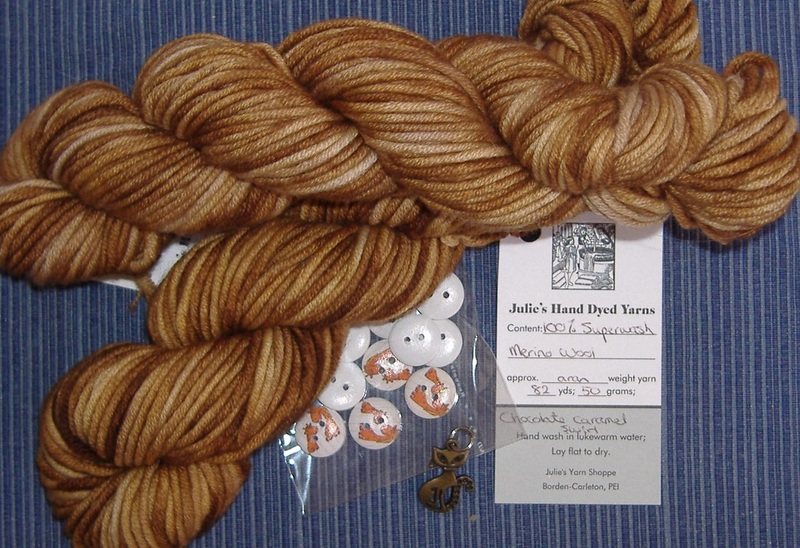 Option 1: The yarn is Julie's Hand Dyed - aran weight, a package of buttons (your choice), and a stitch marker (your choice). 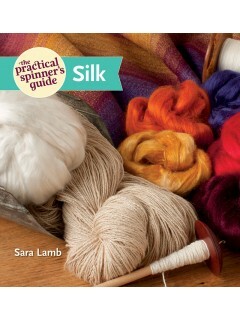 Option 2: A Silk/merino blend scarf blank, 3 packages (1 oz. 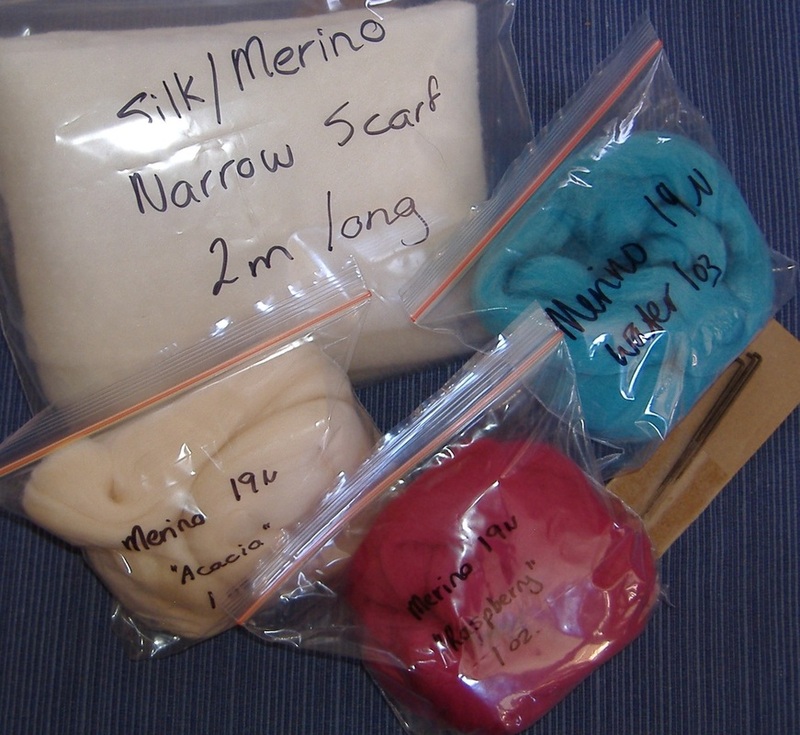 each) of Merino felting fiber (your choice of colours), and three felting needles. I had such fun picking out the prizes! 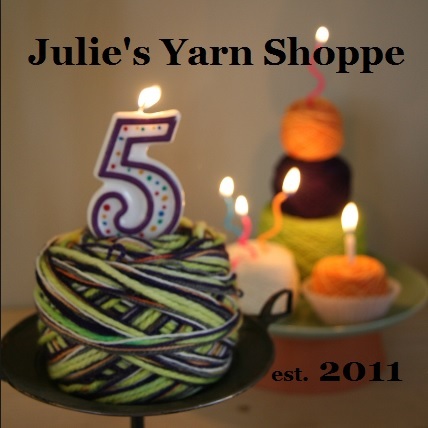 It seems like it was just a short while ago that I was scraping wallpaper, and fixing the walls - racing against the calendar - to open my own yarn shop. Five years! I still wonder how time flew by so quickly. I think it's the perfect time to celebrate. I am going to give away Prizes! The first prize will be given away on Tuesday April 5th. To win, all you have to do is comment below and tell us what you would love to win. 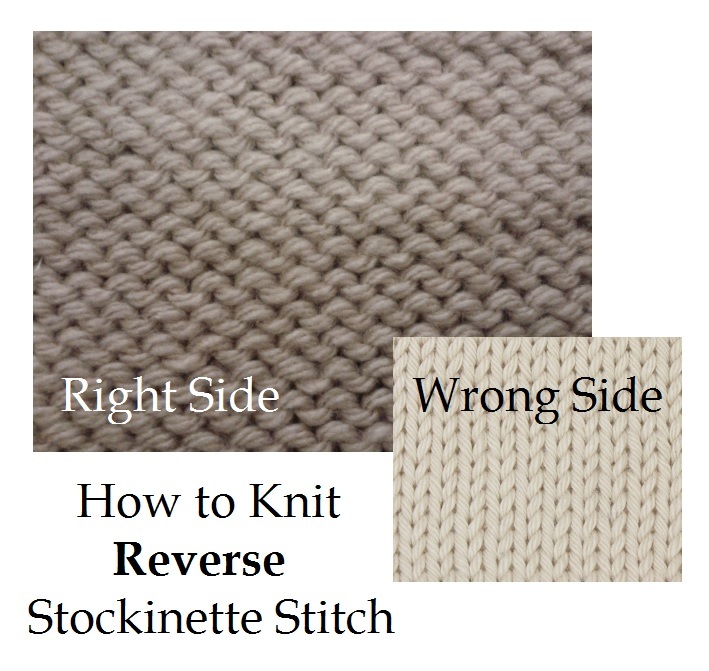 I am frequently asked, "What is reverse stockinette? How do I knit this stitch?" 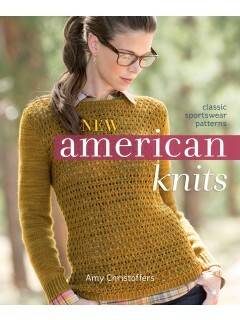 Well, I am happy to tell you that you probably already know how to knit it. If you know how to knit stockinette stitch (abbreviated st st), you're doing it. The wrong side is now the right side. 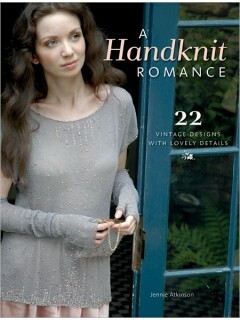 Which is why it has the name reverse stockinette as its name. Ok, for those who are lost and have no idea what I was just saying, I'll break it down for you. You will need to know the knit stitch and the purl stitch. The bumpy side is the right side of the fabric and the smooth side with "V's" is the wrong side of the fabric. It has been a really busy year and I haven't had much chance to do anything let alone blog. Anyway, I would like to give all of you a little Christmas gift. 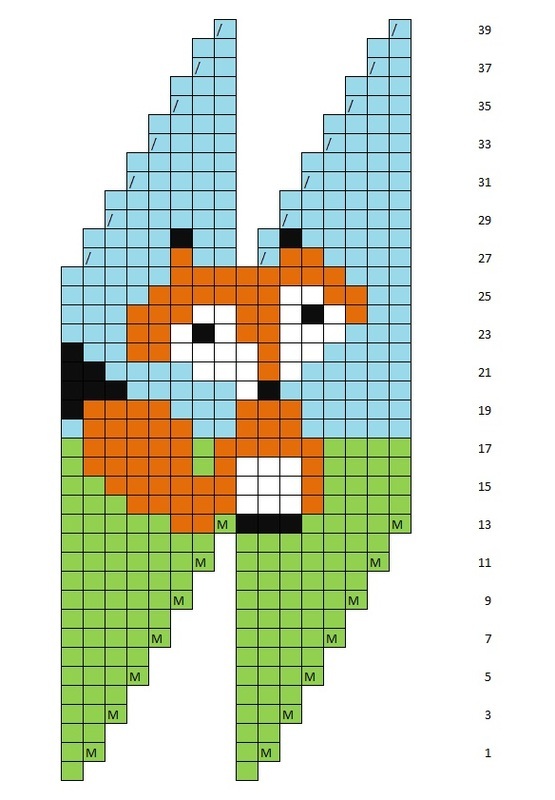 So here is my Fox Ornament pattern. It is a bit tricky - just like this cutie. Cast on 8 stitches (sts), join in the round without twisting the sts. Place marker at beginning of round and slip it each time you come to it. *Make 1, knit 7* rep to end of rnd = 64 sts. Knit rnds 14 to 26 referring to the chart for colours. I simply knitted with green (or blue) and brown. Then I used duplicate stitch to put in the white and black. Oh, and I knitted over the white squared with blue because it is easier to work white over the blue than over the brown. Tricky, tricky! *Knit 6, k2tog* rep to the end of the rnd = 56 sts. Work any duplicate stitches, and stuff half the ball before continuing. Stuff remainder of the ball. 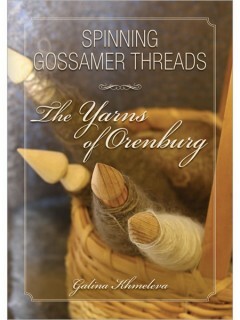 Cut the yarn and pull the tail through the 8 sts twice. 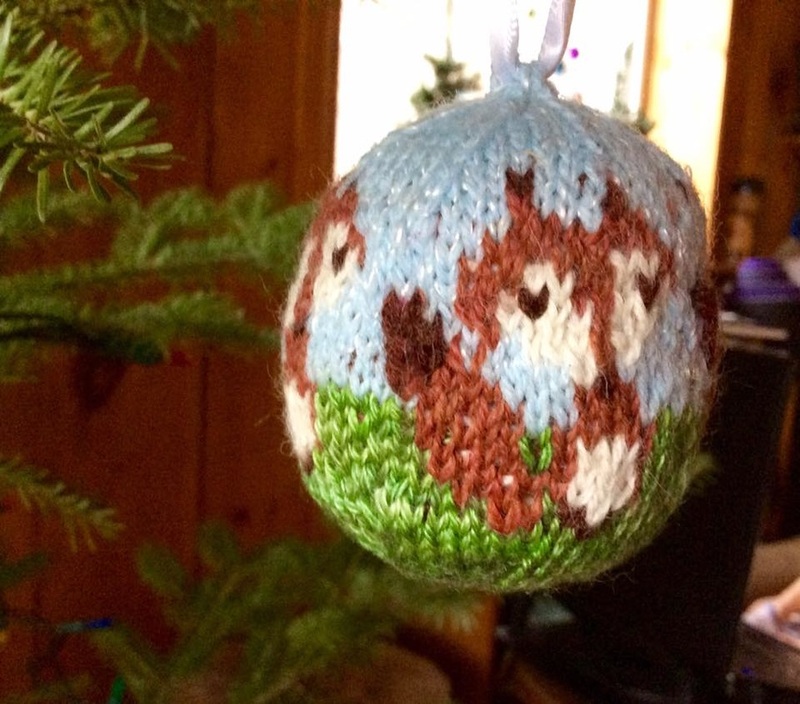 Poke the yarn through the entire ball and cut off on opposite side. Make a pretty hanger with a piece of ribbon about 12 inches long. Stitch it in place at the top of the ball. I hope your holidays were truly wonderful and Happy New Year! Life is always busy around here. I have two new mitten patterns and a wrist warmer pattern waiting to be published that should be available soon. I am always so much more productive when the winter snow lies thickly outside my window. Did you watch the new instalment of Downton Abbey? I did, and I was, once again, engrossed! I find the characters so engaging (I’m particularly fond of the cook and Mr. Bates and Anna); I know I’ll be glued to the TV on Sunday nights for the rest of the season. I recently had the opportunity to show off my LacyTapered Jacket in the Guardian. You can read about it here (and watch a video clip of how I go about getting something like this done). I have been in an agony of suspense for ages. It all began when I submitted a sweater design to a magazine company Between Christmas and New Year (2013). Magazines have pretty strict rules and you can't call them up every few weeks to find out if they've seen your design or are considering it etc. Well, now you know why my blogging is so erratic! I really didn't do anything but knit all March. The kids were very good and didn't ask for anything and my husband quietly did the everyday chores like laundry and dishes without me having to ask. 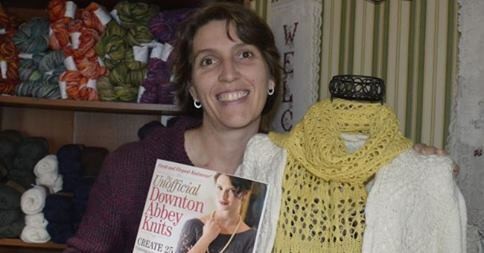 The sweater was sent in and the pattern was written up and e-mailed off in time. Whew! Then for the hardest part ... I was not allowed to tell anyone until the magazine was published! I was so excited to get my magazine, The Unofficial Downton Abbey Knits 2014 issue of Piecework, in the mail this week; now I can tell you my secret. I designed the Lacy Tapered Jacket. Canada Day is here once again! The highway that passes in front is non-stop traffic as truck, cars, and motorhomes pass by. I am sure there are a fair share of holiday-ers and campers in the bunch, after all, this is a weekend devoted to camping, barbeques, and beaches. But we'll be staying home, possibly eat too much, and watch the fireworks. I should be working on my sweater, but I've started another pair of mittens. With the weather warming up, the sweater is just too big and covers my lap now, while the mittens are smaller and cooler to work with. The sweater is inside-out because I want to publish my pattern eventually. I've got about 5cm (2") to go until I get to the sleeves. Maybe I should just knuckle down and knit those couple of inches this Canada Day, then I'll be able to work on the sleeves this summer. 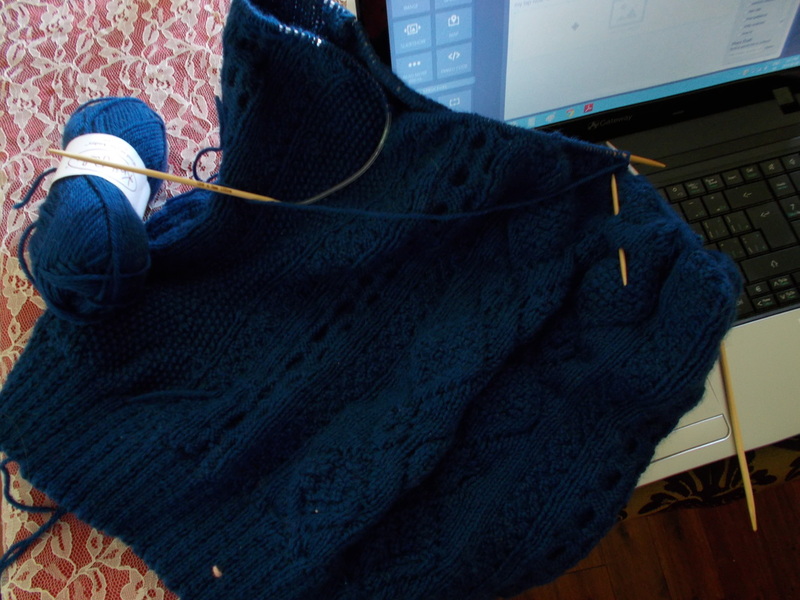 What projects do you have on your needles this summer? I received my new issue of Piecework (May/June 2014) this week and it had an article on needle tatting. Well, I have tried tatting before and I just found myself in a tangle. Tatting is a fancy way of putting knots together on a string to make some pretty awesome lace (for those who haven't heard of it before). 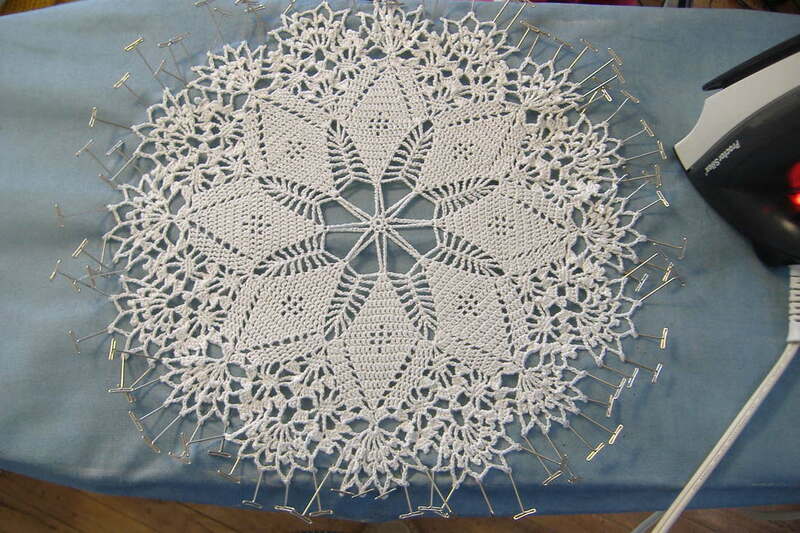 Most times the pattern calls for a tatting shuttle, but in this case the article described using a simple needle to do the work. I found this WAY easier. For one thing, I usually make some of my increase stitches using a similar backwards-loop that needle tatting uses. I also stumbled across a site while on Pinterest that gave a picture tutorial of how to needle tat. 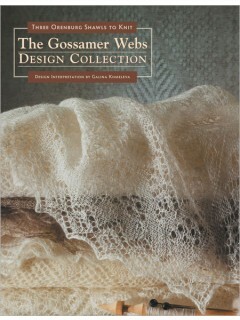 It also has a few patterns near the bottom of the page for those who want to check them out. Tomoko Morimoto has a new book out called New Tatting that I might just have to add to my collection. I learned how to knit before I can even remember, and so I have no idea what my first knitting project was. I remember knitting a T-shaped sweater in my grade 3 class while everyone else knitted samples. It went though our family of 4 kids and is no longer around. My grandmother taught me how to increase, decrease and work yarn-overs when I was around 10 or 12 and I remember knitting about a dozen coat hanger covers. I still have one. Then during my teenage years, I abandoned knitting and took up crochet (thanks to my other Grandmother). We also immigrated to Canada, so almost everything was left behind in South Africa. 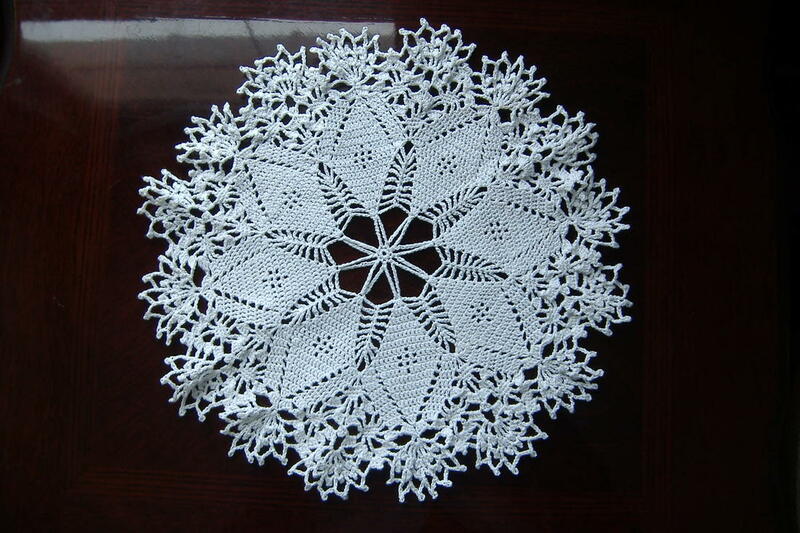 I crocheted doilies and a table cloth. I knitted sporadically when I was pregnant with my children, and only really took it up again with zest about four years ago. For my first project after years of non-knitting, I decided to knit mittens. I had never knitted in the round, increased for a thumb gusset, or worked stranded color-work. I decided to do all three. Working with color-work means following charts - another new thing for me. So I took a book out of the library with numerous knitted mitten patterns and decided to use various different little charts to make a sort-of sampler mitten. My son instantly claimed it as his and I had to knit a second one. My knitting has not looked back from that day. 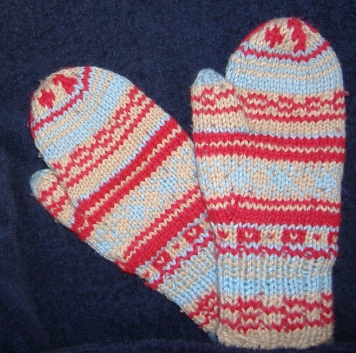 I have knitted all sorts of things - mittens, gloves, socks, hats, sweaters, shawls, etc. And my knitting repertoire now includes lace, fair-isle, intarsia, entrelac, cables, the list goes on.